Welcome to the weekend Popsters! It’s been a SUPER busy week and the next few are going to be even busier so, the Pop Blitz is a Pop Brief today! I saw an amazing concert last night and you’ll want to check back tomorrow for my full review, somedays it’s good to be the Popster King! • Hot Toxic Love, Oozing Soon on Broadway! The Toxic Avenger, the critically acclaimed Off-Broadway musical about an unlikely superhero in New Jersey that played over 300 performances at Off-Broadway’s New World Stages, may be headed to Broadway. A casting notice for the upcoming run at Houston’s Alley Theater (Jan. 20-Feb. 12, 2012) says that Broadway rehearsals will begin in early March 2012 with an opening at the end of March/early April. The same cast, according to the notice, will be used for both the Houston and Broadway runs. The Toxic Avenger, based on the 1985 classic cult film from Lloyd Kaufman, features music and lyrics by David Bryan (keyboardist and founding member of Bon Jovi) and book and lyrics by DiPietro (I Love You, You’re Perfect, Now Change). Bryan and DiPietro are currently represented on Broadway by the Tony-winning musical Memphis at the Shubert Theatre. The Toxic Avenger was directed Off-Broadway by Tony Award winner John Rando, who will also helm the Houston engagement. The closing cast Off-Broadway included “American Idol” Season 3 runner up Diana DeGarmo, Nick Cordero, Demond Green, Jonathan Root and Nancy Opel. The show had its world premiere at the George Street Playhouse in New Brunswick, NJ, where it broke box-office records before transferring Off-Broadway, beginning previews on March 18, 2009, and officially opening on April 6, 2009. A cast album preserves the score. The Toxic Avenger won the 2009 Best Off Broadway Musical Award by the Outer Critics Circle. And now, enjoy a little “Hot Toxic Love” from the soon-to-be Broadway musical, The Toxic Avenger! 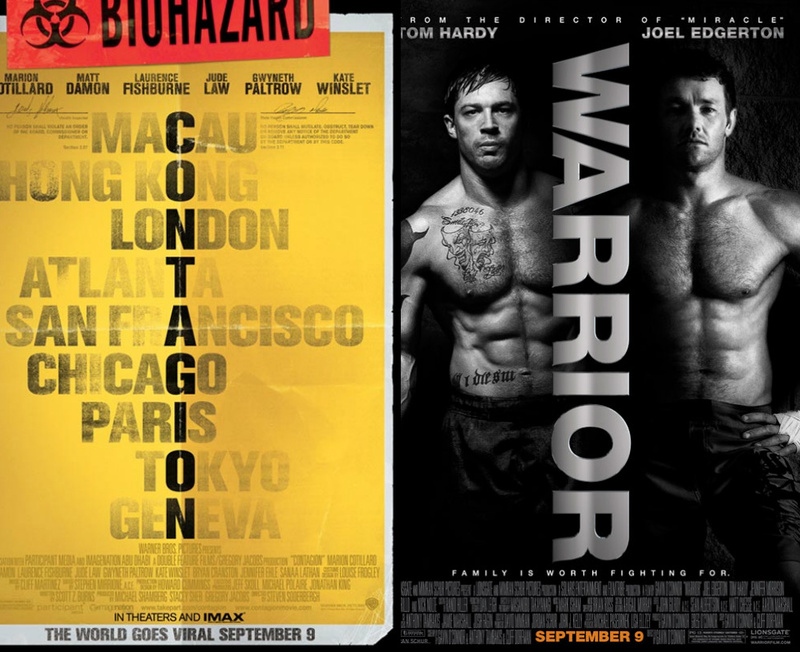 So, Popsters, we’ve got two big flicks opening this weekend, which one do you think you’ll be going to see? First, we have Contagion, starring Matt Damon (it’s always more fun if you read/ say his name with your best Team America impression). For those that don’t know, Contagion is basically an “end-of-the-world-as-we-know-it” flick and a perfect nightmare for any of you germ-a-phobes out there. A virus takes over the planet and pretty much thins our herd which, depending on how you look at it, could be as much of a blessing as a curse. The reviews are, surprisingly, very good. Given we are what I believe is a self-hating species (we LOVE movies featuring our own destruction, right? ), the film should do well at the box office this weekend. The Second film is Warrior, which I had the pleasure of seeing last weekend, (you can read my review below). Warrior is the best film I’ve seen this year, by a long shot. It’s the story of a broken family, two underdog brothers and their recovering alcoholic father, fighting to maintain and reconcile in our extremely challenging world. It’s as timely as it is timeless in it’s subject matter and features some of the best performances you’re likely to see on the big screen in 2011. So, the question is; on this, the 10th anniversary weekend of the attacks on the World Trade Center and the Pentagon, will you choose the film that focuses on our sudden and quick demise at the hands of forces beyond our control or the movie that celebrates our underdog spirit and our will to survive and fight? 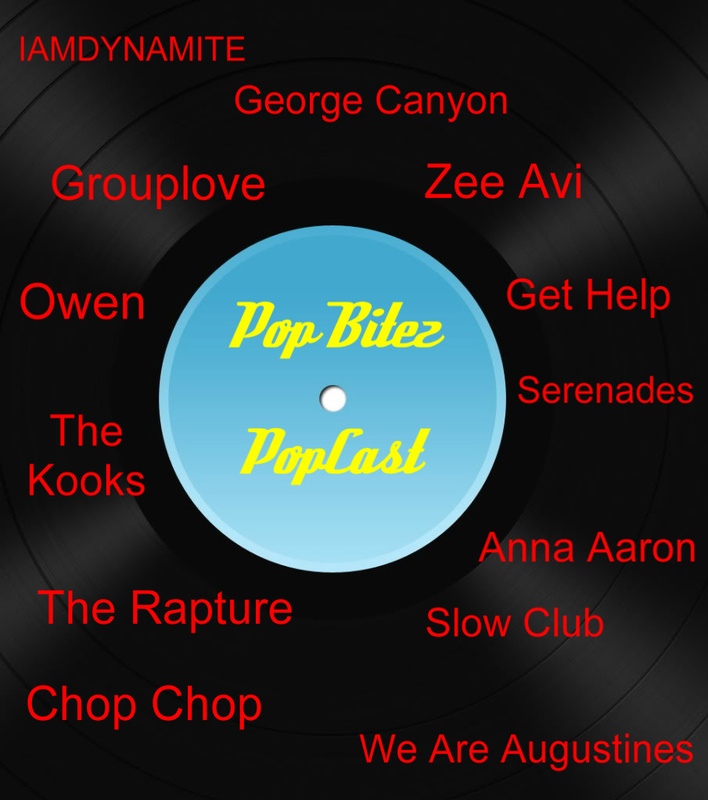 • The Pop Bitez New Music PopCast! That’s right Popsters, it’s that time again! I’ve got a brand new Pop Bitez PopCast for you this week covering all the new releases that are fit to POP! Fall is here, the kids are off to college and, as a result, the indie releases are coming so fast and furious it’s hard to keep up. Never fear, that’s why I’m here, sussing it all out for you! So? What are you waiting for, Pop On!